Way-hey! We’re so close to the end of this series, with only one more installment to go after this one! Where has the time gone! 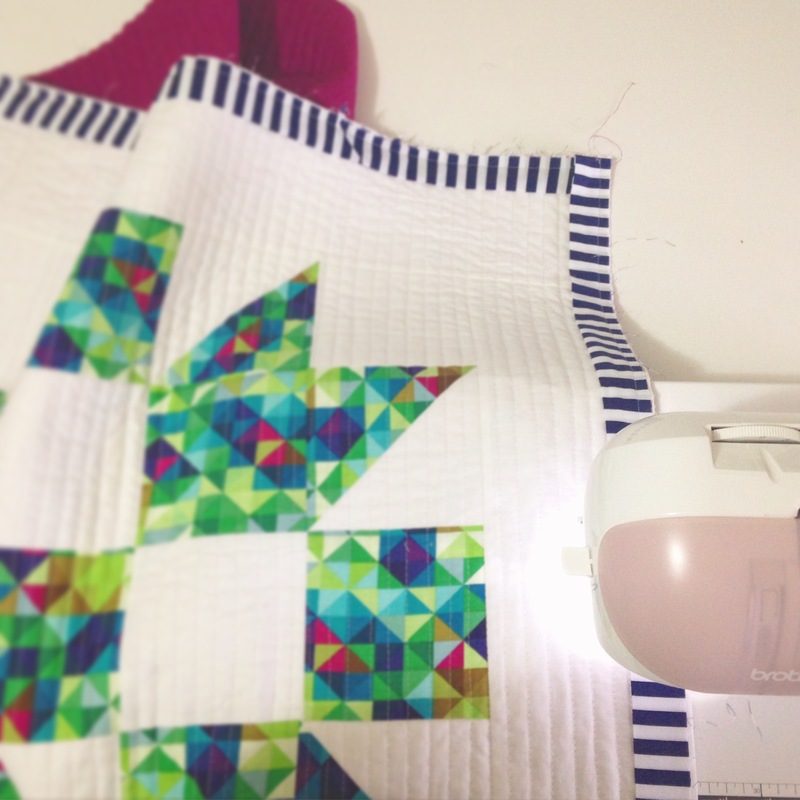 So in part five, we’re looking at how to make and attach a ‘cheat’s binding’ (that is: Straight-Grain Binding) to the raw edges around our quilt using sewing machine and hand sewing techniques! Wow, where did that deep-and-meaningful thought come from…?? Ooo…?! As always I want to encourage you to make and attach the binding to your quilt in the way that you know best and using a method that you find the easiest and/or most successful. You are always more than welcome to use my way as guide or for inspiration! And if you do chose to follow my method, you’ll find all of the measurement and cutting info as well as a quick walk through of the steps to complete this stage in the pattern sheet linked above! I always love it when you share with me your finished blocks, quilt tops and quilting! Feel free to tag me on Instagram* or Twitter at @3and3quarters, send me an email or share them on Facebook! So don’t forget to join me for part six, where we’ll go through the last step in making our quilt – the quilt label! And then…our quilt is officially finished!!! YAY! Previous Post‘Quilt-Along-With-Me’ Part Four: Quilting! Next Post‘Quilt-Along-With-Me! Part Six: Quilt Label & Finish! I’ve done it all: backing as binding (least liked results, but seems used a lot on period stuff) bias binding for curves, and I’m finishing up another straight grain binding right now. I do the 2.5 inch strips with 45 deg attachments, and then stitch on the front edge with the hand stitching on the back. You’re right, so satisfying! I also always do some applique on my baby quilts, a lamb, a frog, a sleepy owl… I did an entire Overall Sam quilt for one friend. Finishing up one now with bluebirds ready to applique, for a little girl… oh, and one on the drawing board for my new niece next month. Thanks for sharing so generously– oh and Thank you for introducing me to Cath Kidston! a lady after my own heart. I never thought of making a book out of all the simple sewing I do for my home. I’ve now purchased two of her books, the second came yesterday, and I can’t wait to get into it! Wow! It sounds like you’ve been busy with some quilts! I love making quilts with applique on them. I’ve made a few for some special babies in my life, featuring little chicks, butterflies and flowers! Add me add me! 🙂 @carissarobyn Instagram is my favorite but I’m always nervous to be public! Don’t want people stealing pictures of my cute dogs. 😉 I haven’t gotten this far on my quilt but I think I’m most nervous about this part without watching your video.. I am most excited about your video to come about the tags! That’s the whole reason I discovered you, afterall.